Supreme Court Agrees To Rule On Constitutionality Of Execution Drug Cocktail : The Two-Way Three Oklahoma inmates say they face the risk of extreme suffering, which would violate the Eighth Amendment ban on cruel and unusual punishment. 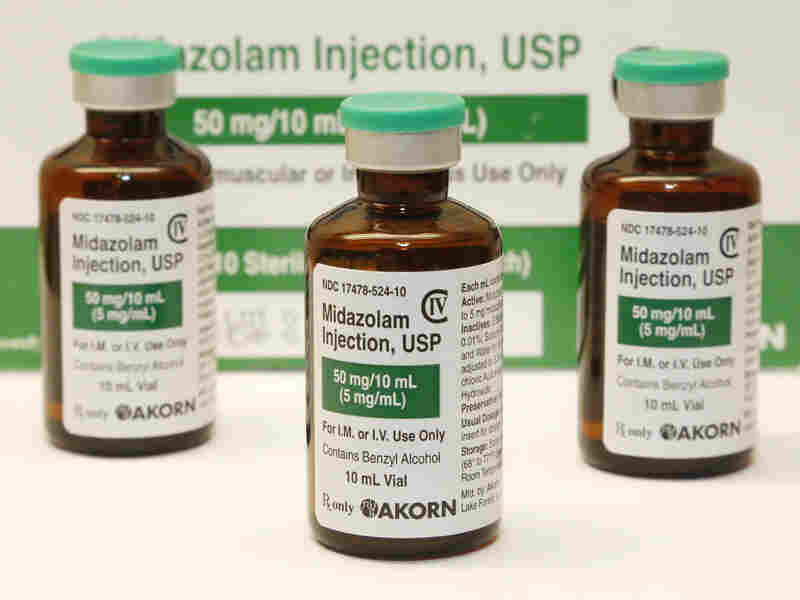 Bottles of the sedative midazolam, which is at issue in the Oklahoma death row prisoners' lawsuit. The Supreme Court has agreed to decide whether the drug is effective at preventing unconstitutional suffering. The U.S. Supreme Court agreed today to review Oklahoma's method of execution by lethal injection. The justices agreed to hear the Oklahoma case a week after refusing to halt another execution that used the same drug formula. It takes the votes of five justices to halt an execution but only four votes to grant review. Therefore, last week, the high court refused to block the execution of death row inmate Charles Warner in Oklahoma, over the objections of the court's four liberal justices. Presumably, the court's five most conservative members voted to allow the execution to go forward. Now, however, the court has agreed to review the questions presented by Warner, but in the cases of three other death row inmates scheduled to be executed soon. Presumably that decision was made by the four votes of the court's liberals. It is not entirely clear whether the court will allow scheduled executions to take place while it considers the issues in the case, but lawyers for three death row inmates said Friday they will be filing motions for stays of execution. In 2008 the Supreme Court upheld a three-drug protocol used by most states in imposing the death penalty. The questions presented in the cases stem from the fact that, since then, pharmaceutical-makers no longer are willing to provide the drugs traditionally used as sedatives in lethal injection. So the states have substituted various doses of the sedative midazolam, resulting in some notable botched executions. The state of Oklahoma says it has fixed its dosages and procedures, but death row opponents contend that the drugs being used are untested, experimental drug combinations that can cause great suffering, in violation of the Eighth Amendment ban on cruel and unusual punishment. The Supreme Court is likely to hear the lethal injection case in April, though it could postpone review until next fall.